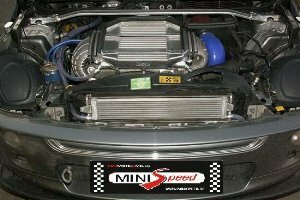 Increases horsepower to 265bhp. The 6th stage of upgrading includes the re-programming of engine control unit (ECU) in stage 6, the replacement of compressor with smaller, the replacement of the crankshaft pulley, the replacement of dynamo pulley, the replacement of belt with a new one with suitable diameter and strength. The 6th stage of upgrading includes the installation of chargecooler, and also a number of other auxiliary replacements - improvements. The pulleys are ALTRA Performance the best for MINI worldwide. The air intake kit is ALTA Performance or M7 Tuning or aFE.